I became a bit obsessed with Poshmark when I accidentally found some shoes I'd been searching for on the site. I didn't even know what Poshmark was before that instance. Then I started selling things and accumulating Posh money - the rest was history. But I have a hard time buying just one item from people, because that shipping kills me. I need to bundle items to save. But that's not the only reason I'm not making purchases. Here's some other reasons that I'm not buying from your closet. 1. You have too much to sift through. I can look through hundreds of items, but if you have 4,000 items in your shop - I'll never get through it all. 2. Your items are mixed up between sold, for sell, and not for sell. I'm tired of trying to figure what I can actually buy. If you didn't sell it on Poshmark, but it's still listed in your shop, why is it even there? Remove it. 3. Your items are overpriced and you refuse to accept offers. Are you even trying to sell your stuff? 4. You don't answer questions people ask. Are you even active? Will you actually ship something if I buy it? 5. Your shop has too many different sizes, so I can't gauge how something will fit. This is so frustrating for me. I hate not being able to try things on anyways, so the fact that your shop has too many sizes doesn't help either. If you've never shopped on Poshmark, you can get some pretty great deals on a huge variety of items - shipping usually $6.49 - but is sometimes discounted, as well. You can make offers on items, bundle groups of items, and even sell in your own shop. You can check out my shop here and use referral code "kaylakedavra" for $5 off your first purchase (I'll get $5, too). If you have a shop, leave your link below and I'll check it out! This article is very misleading. 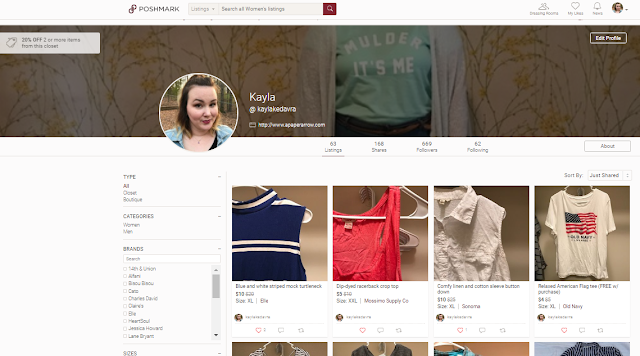 With 2 clicks, a Shopper can filter the Poshmark Seller's "Closet" so that the only things visible are items in the Shopper's size, which are still available for sale. That eliminates Problems #1 and #5 on your list. It sounds like you just don't know how to use the app. Hi there. I'm sorry you don't agree! I absolutely know how to use the app and filter things, but some shops are simply too large for me to sift through. If there are a lot of items in my size, I oftentimes don't want to sift through for hours to find the items I actually like. As for #5, this is more of a sizing issue. As most brands vary in size, it's hard to determine if a 16 in this brand will fit me, even though a 16 in another brand does. The sizes aren't universal across brands unfortunately. For example, I bought a size 18 skirt that wasn't marked vintage so when I got it, it was several sizes too small. If a seller has several different items in sizes ranging from a 2 to a 24, I can assume they didn't all originally belong to that seller. But if the clothes are between 14-18, it's more likely those sizes are just varying per brand. That's my personal opinions on spending my hard-earned money on clothes that may or may not fit me that I'm unable to return and often can't get the same amount back by re-poshing. 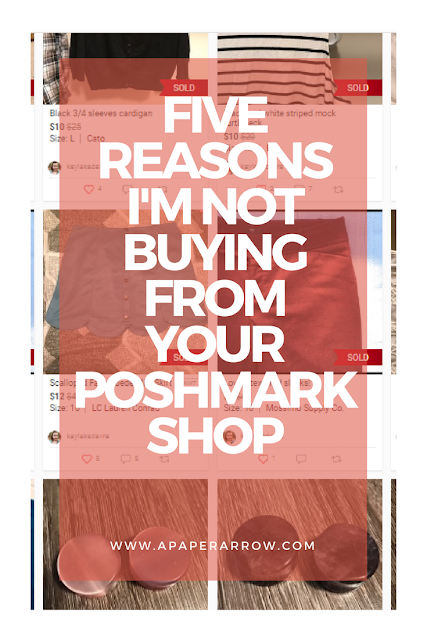 This post isn't here to provide facts about how Poshmark works, it's simply why I personally choose not to buy items. Thanks so stopping by the blog - your views and comments are appreciated! Personally I try to always know the measurements of the items I am buying for myself. Then I know if an item is going to fit or not. Most of the time you can't go by size alone anyway. You have to know your measurements. Compare the measurements with something similar in your own wardrobe. Going by size alone is going to always lead to disappointment. My opinion. And most posh sellers do include the measurements. If you like you can follow my posh closet and I will follow back. poshmark.com/closet/almostantique thanks for the tips.. When I buy and it isn't often I do take advantage of the filters to try to narrow down the selections in a sellers store. Say by clicking tops, or dresses.. You can get it as narrowed down as you want. I love the site. Hi so I’ve been doing this for six years actually, since it started and I don’t mean to be rude or offensive but I just don’t think you understand how Poshmark works. If people didn’t wanna look through closets they would go to a store or buy at full price online. And finding it annoying that you have multiple sizes, it’s called weight fluctuation, different type of body, lotta things. For someone who has made over $17,000 on this, and has over 600 listings I’m pretty sure people with a lot of listings and a lot of different varieties and sizes are the people making money, this article seems as though it’s too much work for you to use the app which is fine, by saying you’re not gonna shop in those peoples closets, ehhh, Most high-end sellers don’t want people shopping in their closet if they’re going to blog and complain about it. So, here's the thing. This post isn't meant to offend and isn't directed at anyone in particular. When I share posts on my blog, they aren't necessarily cold, hard facts, and anything opinion-based (most posts) are entirely my opinion. If you're making tons of money on your Posh page, then you're doing it right. This post isn't an end all, be all of how Posh works. It's just my personal opinion on why I'm personally not shopping, and I realize most people don't shop the way I do. I certainly understand how Posh works, but I also understand what I do and don't want to spend my money on. 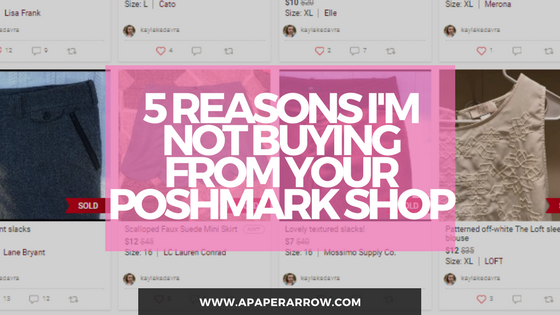 I buy a lot from Poshmark and sometimes sell things (though I don't really care so much about my closet - I'm mostly just looking for things at better prices than I can find in stores). Again, this post isn't directed at anyone in particular, and nothing about this post is FACTUAL, but instead my own opinions.